A passion for "the noble steed" starts at a young age for most horse enthusiasts. The love Jo Hennington Stephenson '12 has for these animals holds true to this statement. 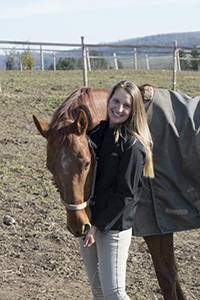 This enthusiasm initially brought her to Central New York to study equine business management at Cazenovia College. It continues to inspire Stephenson as she builds her equine business in the local Cazenovia community. Stephenson's working life began at the early age of eight, when she would walk by herself to her Aunt Sheila's barn in Yaphank, New York. Her aunt, Sheila Rodgers, is an accomplished horsewoman and the owner of Good Shepherd Farm for over twenty-five years. At fourteen, Stephenson began her first "real" job at the farm, where she also learned how to be a skilled rider in the "hunter/jumper" class. Yaphank, New York—on Long Island—is quite a distance from the College. Stephenson discovered Cazenovia at a college fair hosted by Suffolk County Community College. Stephenson shares, "I was interested in the business program and the riding team." She adds, "Cazenovia gave me a fantastic scholarship, and I made the varsity riding team." Stephenson found the equine business management program well suited to her career goals, thriving in her classes with faculty members who share their students' keen interest in horses. Specifically, she recalls a freshman seminar with Dr. Karin Bump, where she learned about how to lobby the state government on behalf of the horse industry. Classes with Professor Carol Buckhout focused on anatomy and physiology, as well as breeding and foaling. With Professor Barb Lindberg, Stephenson learned the essentials of disease and injury. In an upper-level equine business management class with Professor Amy Sherrick-von Schiller, Stephenson was required to complete a formal business plan, touching upon business ethics, taxes, liability, insurance, sales, budgeting, and customer relations as they relate to small businesses in the horse industry. Stephenson shares, "I took everything in that the program had to offer me." With regard to life outside of the classroom, Stephenson participated on the riding team. She also made some good friends, including Christine Petrone '13, Chris Strucker '14, and Alyssa Warawka '12. After graduating in May 2012, Stephenson did not have definitive career plans. Initially, she worked at the Cazenovia Sports Bowl. "I was ready, however, to move on to the next step in my life and find my path," shares Stephenson. Fate brought Beezie and John Madden into Stephenson's life, as they were customers where she was working. In December 2012, Stephenson went to work for the Maddens as a groom. She stepped into a perfect first job; traveling to horse shows throughout Europe including the Netherlands, Slovakia, and France. This side of the Atlantic took her to events in Calgary, Canada, and Wellington, Florida. Four people, including Stephenson, would travel with the horses on a cargo plane – two other grooms and a veterinarian. The grooms were responsible for everything the horses required for day-to-day care as well as competitions including saddles, bridles, and reins among numerous other items. After two years with the Maddens, Stephenson had developed the broad range of skills and knowledge to continue on her path: she had ridden competitively, graduated from a vigorous equine business management program, and worked for an internationally competitive rider. She was ready to take a risk. Just outside the village of Cazenovia there was a once fine house with a barn and paddocks on a large tract of land. It had become derelict, sadly falling apart. Stephenson asked her sister Gina, a 2015 graduate of SUNY Morrisville, to be her partner and work together to create their shared vision for an equine business. They struck a "rent-to-own" deal with the owners and have never looked back, opening in February 2015. The farm's name is Whispering Hill Equestrian Center, and the transformation has taken hard work and considerable funding; the rehabilitation of a piece of local equine history one stall, one board at a time. To date, there is all new fencing; the barn has a new roof, new siding and viewing rooms; and there is now an indoor arena. Stephenson's mother has come into the partnership and takes care of all the business-related paperwork and accounting. The result is a professional, well-run equestrian business, offering full horse boarding, riding lessons, and training. Currently, seventeen horses are on the property including lesson horses, sale (in training) horses, and several "boards" from Cazenovia College. 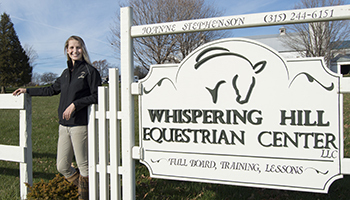 Not only does Whispering Hill Equestrian Center provide a return on investment to the Hennington/Stephenson family, it also has a significant effect on the local economy. Funds are spent on the traditional equine-related businesses like veterinary and farrier services, feed supply, bedding, footing, and sport/ entertainment endeavors. The farm also uses fields as diverse as insurance, financial services, energy supply, construction, and hospitality (restaurants and hotels). Stephenson comments, "We try to keep our business with local vendors, our insurance is through a local firm, as well as our banking." She adds, "Local quarries have provided fill and stone, and our vet and farrier are close by." The economic multiplier impact of the equine industry has not gone unnoticed by numerous stakeholders, including New York state officials, with Central New York now known as "Equine Alley." Studies show that more workers are now employed in the equine industry in New York than are employed in the automotive industry. Outside a very busy career, Stephenson has a thriving family life. She met her husband Tyler through a mutual friend, Tyler Cota, who attended the College. They were married on October 3, 2015, beside Cazenovia Lake, with wedding pictures taken on the College campus. Tyler works for Burdick Porsche in Syracuse, and they share similar professional interests jokes Stephenson. She says, "My husband is into horsepower, and I’m into horses." More exciting news has recently followed, with a baby boy added to their family in 2016. Skylar is a joyful addition to the Hennington/Stephenson family. What's next on Stephenson's path? She looks forward to hosting horse shows and clinics at Whispering Hill. With grit and determination she has built a successful business in the heart of Central New York's "Equine Alley"—in the midst of the land she loves, and among the people and horses she loves.